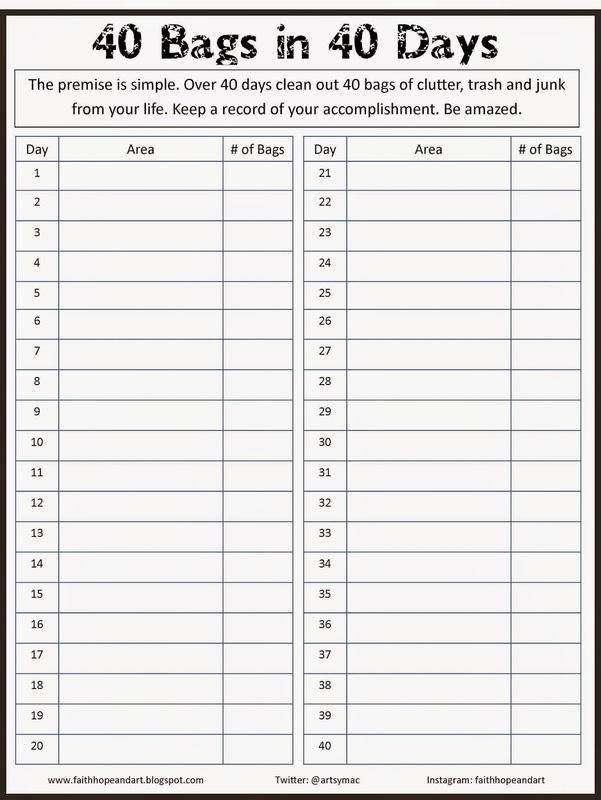 Years ago I completed my first 40 bags in 40 days challenge. It was amazing. I was SHOCKED at how many bags of junk and clutter that I filled and easily got rid of. This year, I'm starting late to do the 40 bags over the 40 days of Lent, but ANYTIME can be a great time to declutter our lives. We don’t have to wait for Lent to be mindful.. or spring cleaning to sort.. or summer to slash.. or the looming holdiays to finally clean things out from the previous year..
We just need to START! So here is my handy chart. I've saved it as a JPEG so that you can save it and use it too. And did you notice that I didn't put dates on it? Just Day 1 and so forth.. so NO PRESSURE and NO GUILT! So what if it takes you all year to get the 40 days of decluttering complete.. that's at least 40 bags more than you would have otherwise!! Won't you join me? I'm starting today.. And I'm going to start with my craft stuff. OUCH! A new level of crazy!